Fishing in the Discount Bin - How the Grinch Stole Christmas! Here we are again on Fishing in the Discount Bin. You know the drill...I watch a movie and blog about it. 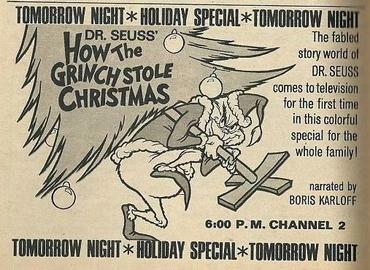 This time out, I'm doing the original animated How the Grinch Stole Christmas. I originally watched this and wrote this on December 16, 2018. We're coming up on the 6th anniversary of when I hit a deer with my car. Before that incident, I used to be so confident about my winter driving. I had a rusty old 1996 Dodge Neon with balding tires, and I'd drive that thing through snowstorms when it was forty below just to get into Edmonton to see a movie. But ever since then, when winter rolls around, I'm checking road reports and weather reports whenever I want to hit the city and I see the mercury has dipped below minus ten. As was the situation a week ago, when the Family Day long weekend rolled around. Thanks to the Polar Vortex, this has gone on record as one of the coldest Februaries in recent history. But it was the long weekend, and I really wanted to get out and do something. I won a free pass to Landmark Cinemas at the office Christmas party, and I had it earmarked for The Lego Movie 2. It was cold during the entire long weekend, but the holiday Monday was predicted to be the warmest, at a balmy minus twenty. So I figured I could do what I did when I went to Bumblebee about a month ago: head to the new-ish Landmark Cinema on the north end of St. Albert. Get in, see the movie, get out, time on the streets would totally be minimized. Waking up on Family Day Monday, and seeing that the extreme cold warning had been brought back didn't daunt me...I had a plan! Until I checked the movie listings for Landmark Cinema and saw that The Lego Movie 2 was already sold out. Gee, one of the biggest family movies in the country is all sold out at the movie theatre that's having all kinds of Family Day specials. Should have seen that coming. But damn it, I wanted out. I needed to see a movie. This was becoming a holy crusade. Yup, because of Landmark's Family Day specials, pretty much everything in St. Albert was sold out. The next closest theatre would be Cineplex's North Edmonton Common. To go there would mean driving straight through St. Albert. Road reports and street reports all looked good. Got a Cineplex gift card for Christmas so could still see it for free. But again, Family Day and family movies, Lego Movie 2 was sold out. Second choice: Alita: Battle Angel. My brain was pondering whether to go through with it, but my hand was moving of its own volition. Before I knew it, I'd purchased my tickets to Alita: Battle Angel. The die is cast. We're doing this. I got behind the wheel, and started up my car. I think I've mentioned this before. I love my car. I've had it for eight years now, and I still think of it as my new car. That rusty ol' Dodge Neon finally gave out at around Thanksgiving of 2010. So, I ran some numbers, got a second job, and got a 2007 Chevy Cobalt, which I'm driving to this very day. I do my best to look after her. The last major repair I got done was she needed the brakes done and a new set of tires about a year and a half ago. She has served me well. But, Dad always said that when a car is more than 10 years old, it's time to start thinking about trading up, because that's when things start falling off. And, as my job frequently requires me to be up before the snowplows, something with four wheel drive would be nice. But for now, my little old Chevy is tried and true. I hit St. Albert city limits, and slowed down accordingly. The city streets weren't too bad. Before I knew it, I had safely made it through St. Albert, and was heading towards Edmonton city limits. I arrived at the power centre that's home to Cineplex's North Edmonton Commons, and saw that I had made it with just enough time for lunch. And wouldn't you know it, a Popeyes Chicken had just opened up in that power centre. Just to refresh your memories.... Popeyes Louisiana Chicken is a very popular fried chicken fast food chain. A few years ago, they were bought out by the same consortium that now owns Tim Hortons and Burger King, and thus began an aggressive Canadian expansion. Popeyes' first western Canadian location opened in Edmonton during the holiday season of 2016, and was a runaway success, with people line up around the block to try it. My first journey to Popeyes Chicken was their third location. I believe this new one on the north side is now officially their seventh location, and would serve for my second visit. No lines out the door this time, as I was easily third in line, and the lunch rush was well underway. Popeyes offers two kinds of combos: the combo and the platter. With the combo, you get one side dish, and a medium drink. With the platter, you get two sides and a large drink. I opted to go for a Chicken Tenders platter, because hey, it's just my second visit. May as well sample as many side dishes as I can. I placed my order, only for the clerk to tell me that they were out of Chicken Tenders. So I went with a two piece platter instead. It's funny. I've recently discovered Reddit, and from there, I've learned this is a common exchange in newer Popeyes locations in Edmonton. Clerk: And would you like to try (promotional item)? Customer: That sounds delicious! I would love to try one! Clerk: Sorry, sir, but we're all sold out of (promotional item). Customer: Then why did you ask me if I wanted one? Clerk: Manager makes us stick to the script. I went with the mild chicken instead of the spicy. It was good. Nice and crispy, and juicy on the inside. For my sides, I opted to go with the coleslaw and the red beans & rice. Coleslaw was nice and tangy, and the red beans & rice had a nice texture to them. Now that this is literally the closest location to me, a third visit will be much easier. 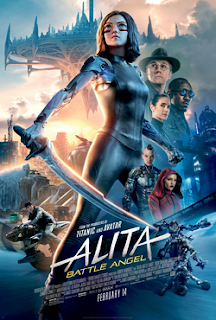 With a full belly, it was over to the theatre to catch Alita: Battle Angel. This is a film that feels like I've been reading about online for years. Based on the manga (Japanese comic book) Gunnm, Alita had one North American fan in James Cameron, he who gave us Titanic and the Terminator films. About 15 years ago, Cameron announced that he had two performance capture epics in development. One was a live action Alita, the other was an original property of his with the code name Project 880. Whichever one took off faster, would be the one he made first. Well, Project 880 turned out to be Avatar, and made all the money. It was widely assumed that Alita would be Cameron's next film, but he got wrapped up making his Avatar sequels. So, a few years ago, Cameron passed the Alita football to Robert Rodriguez, he who gave us Sin City and Spy Kids, to carry to the end zone. And now Alita is finally here. In the distant future, when cyborgs are common place. One cyberneticist, Dr. Dyson Ito, is scavenging the scrapyard for parts, when he finds perfectly intact cyborg head with a still breathing human brain inside. He gives this woman a new body and names her Alita. Alita has no memories of her past life, but finds that being place in extreme combat situations triggers old memories. So, against Dr. Ito's wishes, she gets a job as a hunter-warrior (bounty hunter) and starts participating the extreme sport of motorball. On top of that, there's no shortage of people coming after Alita to kill her. Will Alita uncover the secrets of her past? I liked Alita. Needless to say, it's visually stunning. Our lead, Rosa Salazar, is just adorable as Alita, even when performance capture turns her into a live-action anime character. And it's good to see Christoph Waltz going against type a bit as the fatherly Dr. Ito, rather than the villains he's usually stuck playing these days. My big objection, though, is it really reminded me of John Carter back in the day. You can tell Cameron and Rodriguez are off-camera going, "Oh, man! I can't wait to get into that in the sequel!" It's stuffed pretty full, with hopes of being the next Star Wars and sparking a trilogy. That being said, they do remember to actually end the film and bring it to a satisfying conclusion...something they forget to do in a lot of these franchise-starters. So, yeah. I liked Alita. Three out of four nibs. Full review on the website. This past weekend, though, I was finally able to go about my original plan: straight into the Landmark Cinema in St. Albert to see The Lego Movie 2. As I said when I first visited the Landmark Cinema to see Bumblebee, it is such a nice theatre. The chairs...all the chairs are leather, power recliners. Nice and big so you've got lots of room. Nice, big cup holders. Nice, wide armrests so you're not fighting with your neighbour over the armrest. Such a comfy theatre, and a great place to catch the latest chapter in the Lego Cinematic Universe. Lego Movie 2 is also pretty good. The meta-humour and heart that made the original so memorable is back in full force. In fact, I'd say this one leans a little more towards "sweet" than "funny" this time out. As the big twist of the first film is common knowledge now, they play a little more with the breaking of barriers between the real world and the Lego World. My only complaint is that, well, the freshness of the original is now long gone. 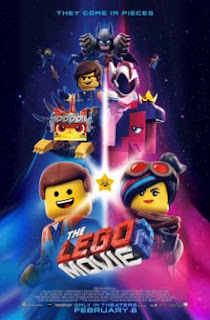 Don't forget, thanks to Lego Batman and Lego Ninjago, this is technically the fourth Lego movie. So the things that were fresh originally are now part of the formula. All in all, it was still a fun movie. Again, three out of four nibs. Full review on the website. My only problem, right now, with the new Landmark Cinema is the power centre it's in is rather new, and doesn't have a lot of tenants yet. So, after the movie, there's not many places to grab a bite. There's a Canadian Brewhouse, and that's about it. And after a movie, I'm more in a fast food kind of mood. I made a quick stop to the power centre next door for a browse through Wal-Mart, and came out mildly disappointed. The action figures for the new Star Wars cartoon, Star Wars Resistance are now on store shelves, and I'm on the prowl to acquire some for my collection. But, sadly, Wal-Mart was all sold out. With that mild disappointment, I decided to hit the power centre up the road and grab a late lunch/early supper at Panda Express. This is quickly becoming a favourite stop of mine as I leave St. Albert. It's pretty much the same greasy Chinese food you'll find in a mall food court, but it is rather filling, and it has just the right amount of spice. And then I ventured home, on roads much nicer than the ones on Family Day. It looks like our long, cold February is almost at an end, and I'm looking for things to warm up. Hopefully, when i go see Captain Marvel in a couple weeks, it'll be with much less drama. Here we go again on Fishing in the Discount Bin. I watch a movie and blog about it, because I need something to do on the weekends. 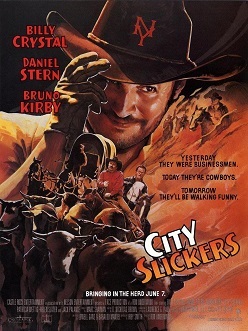 This time out, I'm watching the 1991 classic City Slickers. I watched this and reviewed it on December 16, 2018. Here we go again on Fishing in the Discount Bin. I watch a movie and blog about it. Simple as pie. Anyway, in my notes, I'm currently going through all the Christmas movies I bought and watched this year. I'm up to National Lampoon's Christmas Vacation, which I bought and watched on December 9, 2018.